The 1895 Morgan Dollar is one of those enigmatic issues that is only known to exist in Proof format, struck specifically for collectors and not for circulation. It is placed in a relatively limited list which also includes both 1884 and 1885 Trade Dollars, the 1884 Double Eagle and a few others. But within this list the 1895 Morgan Dollar, without doubt, is the most famous and widely-known of the Proof-only coins struck by the United States Mint. The main reason for this appears to be the overall popularity of the Morgan Dollar, struck between 1878 and 1904, and again in 1921. In fact, together with small cents, it is often considered to be the most collected series within the full spectrum of American coinage. Reasons for the Proof-only mintage of the silver dollar at the Philadelphia Mint in 1895 are not difficult to find. Since 1878, the Mint had struck enormous numbers of silver dollars despite relatively limited use within commerce. The Philadelphia Mint, per the records of 1895, had more than 50 million freshly minted silver dollars in their vaults, while the treasury building in Washington D.C. contained the amazing number of over 100 million silver dollars. The Branch Mints, located at San Francisco and New Orleans, and the former mint of Carson City also had millions of silver dollars in storage. The Bland-Allison act of 1878 and later the Sherman Silver Purchase Act of 1890 were responsible for the excessive production of silver dollars and resulting buildup within government vaults. The act required that the United States Treasury bought a certain amount of silver each month and put it into silver dollars, which would then enter circulation. However, these silver dollars were unpopular in everyday commerce, and except for a few small and remote places (in particular in the Western United States) they did not circulate at a large scale. Mint records from 1895 indicate that 12,000 Morgan dollars were struck for circulation at the Philadelphia Mint; meaning twelve bags (one Mint bag contained 1,000 silver dollars). Yet, not a single circulation strike 1895 Morgan dollar has ever been located and even well-worn examples are still considered to be Proofs. While numerous scenarios have been offered to explain the fate of the twelve bags of Morgan Dollars which were reportedly struck at the Philadelphia Mint in 1895, most experts now agree that none were ever minted. Modern research into the Mint archives has yielded that the number mentioned was most likely an error; and that the 12,000 coins which were minted were not dated 1895. This theory is supported by multiple facts, including the inclusion of a Proof example of the silver dollar when coins of the previous year were submitted to the assay commission in early 1896. Another possibility (but less popular with modern numismatists as there is not much evidence to support it) is that the coins were minted, but melted at a later date, most likely in 1916. All of the 1895 Morgan Dollars that are known to exist are proofs and they are all rare. Mint records indicate that a total of 880 silver dollars were struck for inclusion in Proof sets. These Proof sets had gradually become more popular and included minor coinage (cents and nickels) and the silver coinage (dimes, quarters, halves and dollars). Gold denominations were also minted in Proof format, but these had to be bought separately, and had much lower mintages. From the estimated number of survivors, approximately half of the mintage or slightly less, the mintage number of 880 Proofs appears to be correct. Although it has never been challenged, it is very well possible that not all Proofs were sold, and that some were later melted. Like with all United States Proof coins both PCGS and NGC differentiate between coins with Cameo & Deep Cameo contrast (called Ultra Cameo by NGC), and those that lack these features. Population reports are often influenced by numerous resubmissions of the same coins, in hopes of either a higher grade or a possible Cameo designation. This has to be taken into account when determining rarity and value of an 1895 Proof Morgan Dollar in any grade. The absolute finest known 1895 Proof Morgan Dollar that has ever been graded by the grading companies is a single PR-69UCAM graded by NGC. That high-end and most amazing coin has not appeared at a public auction since it has been certified, and its value can only be considered to be vague guesswork at the best. The finest that have been graded with the Cameo designation by NGC are seven PR-68CAM’s, although the number of individual coins in this grade does not appear to be higher than four or five at the most. NGC has also graded three examples as PR-69. The finest grade that has been awarded to a 1895 Morgan Dollar by PCGS is a single PR-68DCAM, one of only seventeen with the Deep-Cameo designation. The finest Cameo examples are five pieces graded by PCGS as PR-68CAM. Taking the total population (including resubmissions) at PCGS into account, only fifteen percent of all 1895 Morgan Dollars are with the cameo designation, while the population report at NGC shows a similar scheme. This indicates how rare this issue is in Cameo/Deep-Cameo. The highest price that has ever been archived at public auction for this issue was for one of the PCGS PR-66DCAM’s, which sold for $ 120,500 in April of 2007. 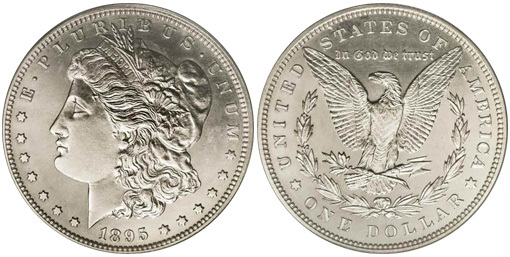 An “uncirculated” Proof 1895 Morgan Dollar (60 or finer) sells for at least $25,000 and goes up from there. Gems are usually sold for at least $50,000 and often much more, depending on eye-appeal. A well circulated (Very Fine) Proof sells for anywhere between $15,000 to $20,000 and AU Proofs can even sell for more, depending on eye-appeal and the overall coin market. As such, it is needless to say that the acquisition of any 1895 Proof Morgan dollar, regardless of grade, is a true prize and often the highlight in a full set of Morgan silver dollars.